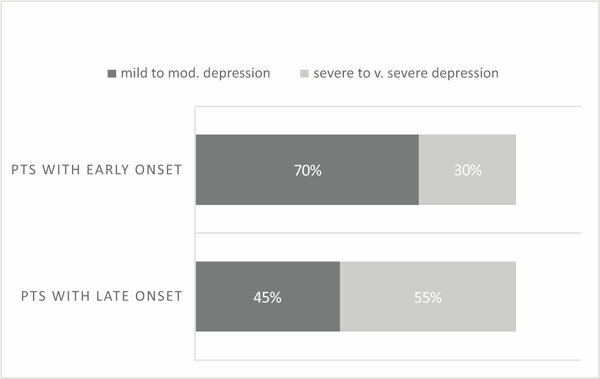 Background: Three-quarters of patients with major depressive disorder have late-onset depression. Late-onset depression is more often associated with cognitive impairment than earlyonset depression and evidences showed a relationship between vascular factors and late-life depression. Objectives: To compare cognitive functions between late-onset (≥60 years) and early-onset (<60 years) depression in elderly patients and to highlight the effect of vascular risk factors in elderly patients with late and early onset depression. Methods: This was a cross sectional, case control study with consecutive referral done on eighty elderly patients with depression who were recruited from Geriatric Outpatient Clinic of Psychiatry and Addiction Prevention Hospital, Al Kasr Al-Ainy, Cairo University. They were divided into two groups according to the age of onset of depression: Late Onset Depression (LOD) group and Early Onset Depression (EOD) group. They were cognitively assessed using ACE III, Framingham risk score for vascular risk assessment. Results: Late onset group had worse performance than early onset group regarding memory, verbal fluency, language, visuospatial abilities and had more vascular risk. Conclusion: Elderly patients with late onset depression had higher severity of depression as well as they were more cognitively affected regarding memory, verbal fluency, language, and visuospatial abilities. Vascular risk factors especially hypertension and diabetes mellitus were higher elderly patients with late onset depression and affects the severity of depression and degree of cognitive impairment. Keywords: Depression, cognitive impairment, elderly, vascular risk, neurologic diseases, framingham risk score. Keywords:Depression, cognitive impairment, elderly, vascular risk, neurologic diseases, framingham risk score. Abstract:Background: Three-quarters of patients with major depressive disorder have late-onset depression. Late-onset depression is more often associated with cognitive impairment than earlyonset depression and evidences showed a relationship between vascular factors and late-life depression.